Built in 1978, Hadda-Havit is reminiscent of a time when the Outer Banks was still an up-and-coming tourist destination. Today, you can still enjoy our unspoiled beaches and that same unparalleled OBX charm in this classic style beach box. To ensure a fantastic vacation, this Semi-Oceanfront home also provides the comfort of modern amenities and is just a short 5-minute walk to the lifeguarded Asheville Drive Beach Access (0.2 miles away) with parking and outdoor showers. As you pull up, you’ll notice a large carport area making unloading a breeze even if the weather isn’t cooperating and there is additional space in the driveway for another vehicle. After a day of playing in the waves, you’ll be able to rinse off under the outdoor shower to easily get rid of all that sand. Inside, the bottom-floor is designed so that all of the kids in your family can have their own little section of the house to themselves. There are two bedrooms on this floor – one with 2 Twin Beds and another with 2 Sets of Bunk Beds – and both bedrooms share a Full Bathroom in the hall. A Laundry closet completes the level. Upstairs, the charm of this home really comes to life with a quintessential beach-box layout and open-style floorplan. With plenty of seating space in the living area, you’ll love sitting down for a family movie as you enjoy the nautical décor and bright, natural sunlight that will radiate inside from the large windows. The dining table has seating for 8 and you’ll enjoy whipping up a masterpiece in this fully-stocked kitchen featuring an island-style bar and plenty of counter space for meal pep. There are two more bedrooms on this level – each with a comfortable Queen Bed - that both share a Full-sized Bathroom accessible from the hallway. The true hidden gem of this house is the covered oceanview deck. There is no better way to relax than sipping your morning coffee on the deck as you soak up the ocean breeze and watch the sunrise over the Atlantic Ocean – and you’ll be able to do that every morning when you book Hadda-Havit! 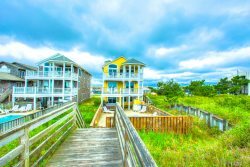 Hadda-Havit is centrally located around MP 7 in Kill Devil Hills - the heart of the Outer Banks - a prime spot where it’s easy to enjoy all the Outer Banks has to offer. Across the Bypass, a Publix Super Market is a great place to pick up your groceries for the week. If you don’t want to cook, head just 0.3 miles North to Goombay’s Grille & Raw Bar to enjoy fresh, local seafood with a Caribbean flare. For a fun family activity, Lost Treasure Golf is an exploration-themed mini golf course with a rideable mining car that the kids will love. You’ll also be just a few minutes away from the Wright Brothers National Monument and Museum where you’ll learn all about America’s role in aviation technology and why Orville and Wilbur Wright chose the Outer Banks as the first place to launch their historic Wright Flyer. For the anglers in the family, the Avalon Fishing Pier is a great place to try your luck and continuing the theme of classic Outer Banks, you will appreciate that this pier has been a local favorite since it was built in 1958. With access to modern amenities and fun local attractions combined with a little old-fashioned charm, Hadda-Havit is the perfect place for your next beach vacation!